Home » Conservation » Environment » Why are globally endangered great hammerhead sharks still being fished by locals? In March of this year, the Convention on International Trade in Endangered Species of Wild Fauna and Flora (CITES) voted to list five commercially fished species of sharks and three species of rays currently threatened with extinction. One of those species is the great hammerhead sharks. That means that the sale of fins or flesh for export is prohibited under the CITES Appendix II regulation, something Belize is forced to uphold. For that reason, the killing of a great hammerhead shark on Caye Caulker this week has been met with outrage by environmentalists and other concerned citizens in the area. That’s because great hammerhead sharks are considered globally endangered, and sightings of these creatures in Belizean waters is not common. 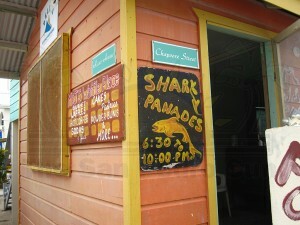 Fishermen with a special shark fishing license claim to fish for shark to supply local markets where it is cooked in Belizean cuisine, specifically the traditional shark panades. The fins on the other hand are suspected to be illegally taken to Guatemala where it is later shipped to Asia where the demands are high and the market price is highly attractive – an activity that is all illegal and internationally banned. 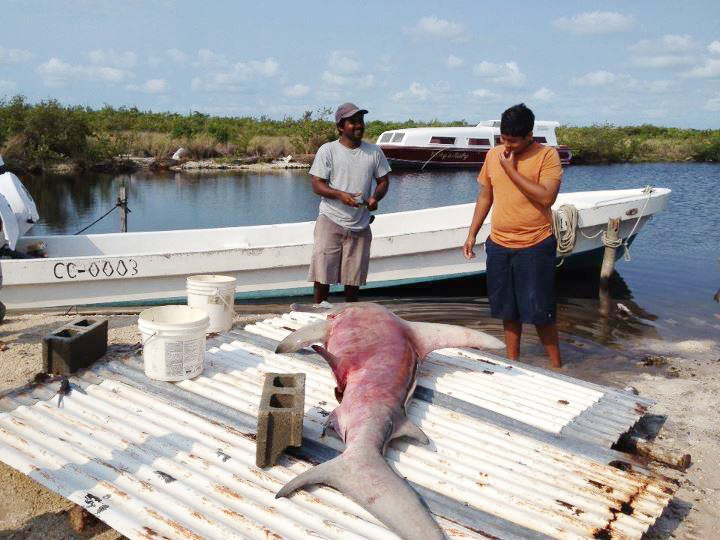 But even as various international organizations banned such activities, the Belize Fisheries Department continues to allow shark fishing in Belizean waters. In 2013 alone, 65 shark fishing license were issued – something that environmentalists claim goes contrary to regional and global efforts to protect endangered species such as the great hammerhead sharks. Even more so, it sets back the local effort done in Belize through the Belize Shark Project, which studies and documents the shark population in Belize. Adding to the argument that sharks are worth more alive than dead is that shark sighting are a critical component in aquatic tours offered by tour operators in Belize. Shark sighting is an added attraction that tour guides highlights to tourists when visiting popular dive sites off Caye Caulker, Ambergris Caye, Blue Hole and Turneff Atolls just to name a few. Belize’s sharks and rays conservatively generate a minimum of BZ$10 million annually in renewable tourism revenue, but the sad reality is that the shark population is quickly dwindling. Conservation Scientist for Wild Life Conservation Society Dr. Rachel Graham says that the slaying of sharks for local or even international consumption is disheartening given the CITES effort to protect the endangered great hammerhead and even local efforts to protect them in Belize. “This is a species that has been deemed by the International Union for the Conservation of Nature to be globally endangered to extinction. The great hammerheads used to be very common around Belize but their population has heavily dwindled due to intense fishing pressure, and the hammerheads that we see now are very, very few. The hammerhead that was captured was about 8 feet long thus it’s a mature size. Finding mature great hammerheads these days is really, truly, a rarity. It is quite a loss for Belize,” lamented Dr. Graham. According to residents from Caye Caulker who saw the shark, they recognized the shark as being one of the sharks that frequent dive destinations off Ambergris Caye and Caye Caulker. “To me it’s very disheartening to see the loss of a large top predator, especially one like a great hammerhead shark. They play an incredible important ecological role in keep the coastal marine environment in good shape. When we lose them there are all kinds of marine ramification to the ecosystem,” highlighted Dr. Graham. She is the lead researcher for the Belize Shark Project currently ongoing off Caye Caulker and Ambergris Caye. According to Dr. Graham, the argument that shark is a traditional food is not necessarily the case nowadays, since most Belizeans are not considered heavy consumers of shark. “We are not in the position like other countries where people are desperate for protein that they absolute have to fish for shark. A lot of the shark catch in Belize tends to go over the border where it issold, and some ending in the Asian market,” pointed Graham. Moreover, sharks are not healthy to eat, detailed Graham who also said that recent study in Belize shows that tissues of 172 sharks from 11 species in Belize showed that over 80% of samples had unacceptable levels of mercury – a potent neurotoxin dangerous for human consumption. 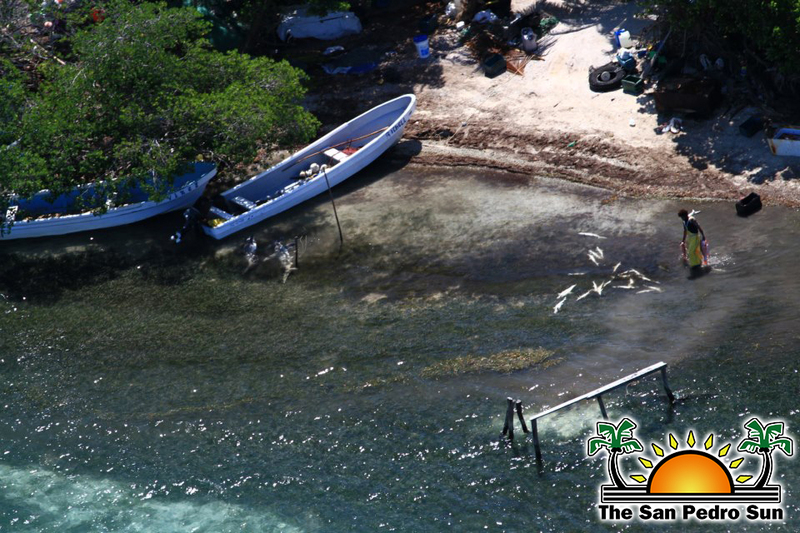 Over flights with Lighthawk to look for possible critical shark habitats on February 17th, a shark fishing camp at Robinson Point in southern Belize was seen, with visible catch (24 sharks) consisting primarily of hammerheads. 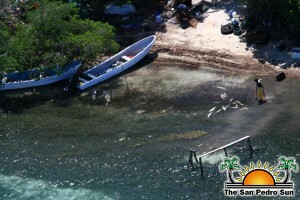 Robinson point is an access point for shark fishing; the shark carcasses are believed to be exported by Guatemalans with Belizean fishing licenses. Graham also explained that the killing of endangered hammerheads brings into question the practice by the Belize Fisheries Department that continues to grant shark fishing permits, making it legal to fish sharks that are being listed internationally as globally endangered, near extinction. “What is even more disheartening to hear is that the Fisheries Department considers sharks to be an underdeveloped resource, and as such has given out 65 shark fishing license,” pointed Dr Graham. The killing of the great hammerhead brings into the question the amount paid for shark fishing licenses versus the amount lost from allowing shark fishing in Belize. “What this brings into question is the fact that for the cost of shark fishing and export licensing, which is equivalent to $2,000 Bze, we are giving away the equivalent of millions of dollars of tourism revenue as a one-time non-renewable resource,” said Graham, who also said that Fisheries Department does not consult with shark conservation stakeholders before issuing shark fishing licenses. Dr. Graham also brought into question the calmness by which equally important stakeholders such as the tourist guides association, tour operators, The Belize Tourism Board and even The Belize Tourism Industry Association who appear not to be concerned by the issuing of shark fishing permits, something that can be detrimental to the tourism sector if not properly regulated. Several studies have shown that populations of several commercially fished species of sharks and rays have declined over 80%, with hammerhead populations decreasing by over 90%, something that is become more notable in Belize. Dr. Graham says that action such as allowing the fishing of endangered species as was the case with the great hammerhead shark killed in Caye Caulker is what international organizations look at when evaluating a country. Coincidentally this week the European Union Parliament Fisheries Committee blacklisted Belize and seven other countries, considered non-cooperative in the fight against illegal, unreported and unregulated (IUU) fishing. The European Commission had adopted on November 15, 2012, a decision indicating the list of countries, including Belize, that have an insufficient record in tackling illegal fishing and that they risk being identified as countries it considers non-cooperative in the fight against IUU fishing. This decision was the first of its kind, but did not entail any trade-affecting measures. Should the situation not improve, the European Union (EU) could take further steps, which could entail trade measures such as a ban on Belize selling fisheries products to the EU. The San Pedro Sun was unable to find out where the carcass and fins of the endangered great hammerhead ended. The San Pedro Sun attempted to speak with the Minister of Forestry, Fisheries and Sustainable Development Lisel Alamilla but we were told she was in a series of meetings. Our requests to speak to Fisheries Administrator Beverly Wade were met with the same response.